Nina Jäckle * 1966 in Schwenningen, grew up in Stuttgart, went to language schools in French- speaking Switzerland, wanted to be a translator but at the age of 25 started writing, first radio plays, then short stories, then novels. Her first books were published by Berlin Verlag: Es gibt solche, Noll, Gleich nebenan and Sevilla. 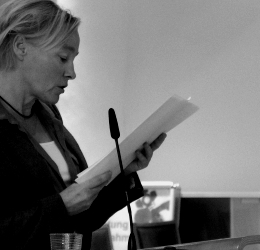 Nina Jäckle has received numerous literary prizes, for example the Karlsruhe radio play prize, the Baden- Württemberg Grant, the Heinrich Heine Grant, the Bavarian Literary Grant and the a Grant from the German Literary Fund. She is a member of the VS Baden – Württemberg (the German Writers’ Association) and German PEN. Her previous work has been translated into French and Spanish.